Not exactly sure how you let someone down easy that they’ve been made a fool of and that all their endeavors have been a sham, but I’m pretty sure that wasn’t it. Nathan will be drawing caricatures at the Ramsey County Fair in Saint Paul, MN this week from Wednesday to Sunday. It’s a cute little show in our own back yard, but there are some good cover bands and all the corn dogs you can eat. Hope everyone had a fun holiday weekend! 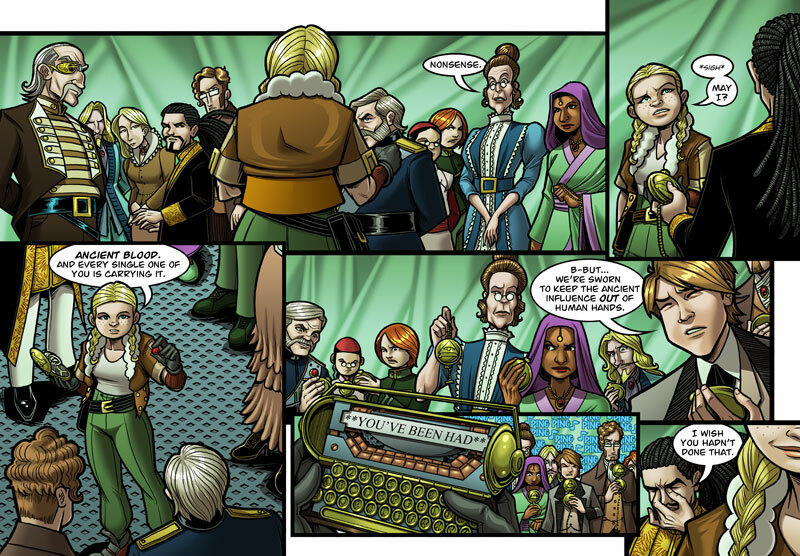 We now return you to our regularly scheduled webcomic as we close out Chapter 14. What role will these Watcher schmucks play in the coming conflict? Check back every Monday to find out. Have a good week and keep circulating those links! I’d like to think this was the best thing Mac could have done for this ‘secret society.’ But I kind of doubt any of them have the cranial capacity to process the implications of what she’s shown them. Regardless, it was satisfying to watch. Does one notice a certain degree of resignation in Caspian’s words? Or is it just that I know that Mac’s being Mac?